Originally a Rhenish mission station formed in 1852. Copper was mined there from 1853 until 1933. The Nama people named this area Th’aries after the couch grass that grew along the banks of the stream and this was later changed to Garies. An excellent fishing and crayfishing destination. A small village set amongst enormous granite mountains known as the Kamiesberg, Kamieskroon was originally a descendant of a former town, Bowesdorp. Kleinzee is one of the sites where diamonds were first discovered. It is home to the Okiep Copper Company and the region’s largest copper-mining town. Okiep is known to have the richest copper deposits in the world. Figs, grapes and pomegranates grow at this mission station established in 1872. Port Nolloth, a centre for both the crayfish industry and alluvial diamond mining. 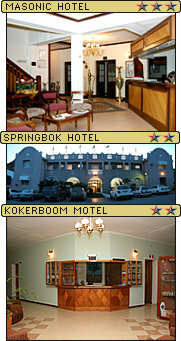 Port Nolloth is the only holiday resort on the Diamond Coast. The town's main tourist attractions are clean beaches and excellent fishing. Transfrontier National Park, accessable by 4x4 vehicles only, the Richtersveld is one of nature's gifts not to be missed. Home to several animal, plant and fish species this park offers the outdoor enthusiast everything and more. Springbok, ideal stopover between Namibia and Cape Town on the national N7. Traditional dome-shaped reed huts made by the Nama people dot the landscape. There is also a date plantation in the area which is worth a visit.